When a colleague mysteriously disappeared after taking a job at an exclusive private school, Clara Oswald felt compelled to investigate things on her own. Naturally, The Doctor saw fit to get involved as well. Now, as Clara explores the school along with two misfit students who don't quite fit in with the insular environment, The Doctor will go exploring the nearby town, disguised as a rough old sea dog. The Ninth Series of Doctor Who put forth the idea that Twelfth Doctor had begun letting his old selves come out to play. With that idea in mind, it seems that Robbie Morrison has written The Doctor as a combination of Jon Pertwee's super-spy and Tom Baker's mad Bohemian. That's as good an explanation as any for why the normal gruff Twelfth Doctor is now playing dress-up with a disguise kit and adopting a stuffed fish as a companion. The comedy works, however, and proves a welcome counterpoint to the Lovecraftian horror of what is going on at the Ravenscaur School. 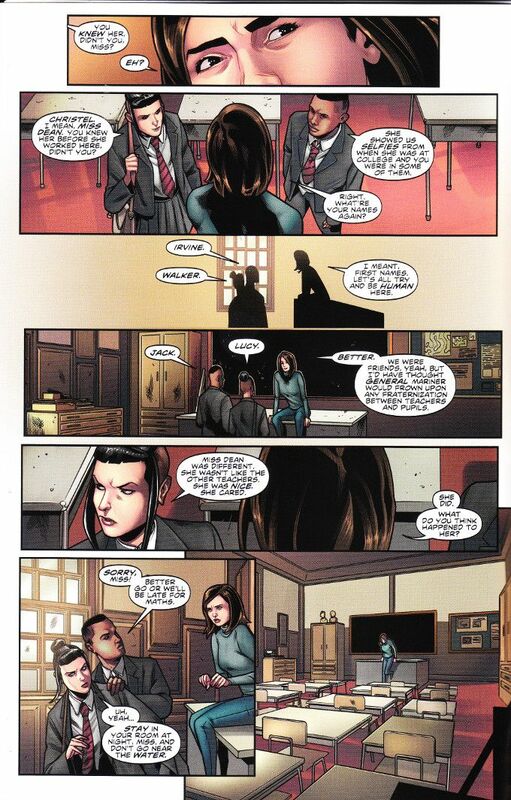 The art by Rachael Stott proves a perfect match for Morrison's scripts. There is a sense of manic energy to Stott's work that serves the comedic scenes well and lends a sense of urgency to the dramatic moments. The colors by Ivan Nunes are well chosen with lighter shades utilized in the funny bits and darker colors being used for the rest of the book.